The Parke-Bernet auction was covered by Newsweek which noted that the auction "was bound to raise the question that the art world had been quietly asking: is Abstract Expressionism passé?" Scull was apparently selling off his Abstract Expressionist works in order to finance his Pop Art buying spree. "I would like to say a few words about the greatness of Milton Avery. I cannot tell you what it meant for us during those early years to be made welcome in those memorable studios on Broadway, 72nd Street, and Columbus Avenue. We were, there, both the subjects of his paintings and his idolatrous audience. The walls were always covered with an endless and changing array of poetry and light. Milton Avery is buried in the Artists Cemetery, Woodstock, New York. 1965: Robert Motherwell creates the Lyric Suite series. 1965: Adolph Gottlieb receives American Academy of Achievement award in Dallas, Texas. January 30, 1965: Burgoyne Diller dies. Abstract artist Burgoyne Diller was a founding member of the American Abstract Artists and, during the latter half of the 1930s, headed the Mural Division of the Federal Art Project of the WPA. He continued to work for the WPA in various roles during the first half of the 1940s. It was largely through his efforts that abstract art was accepted on the Project. 1965: Barnett Newman makes his first steel sculpture. January 13 - February 19, 1965(? ): "The Decisive Years, 1943 to 1953" at the Institute of Contemporary Art. Included work by Barnett Newman, Willem de Kooning, Jackson Pollock and Clyfford Still. February 1965: Willem de Kooning formally ends his relationship with Sidney Janis. Janis was becoming increasingly angry at de Kooning for selling his works privately. When de Kooning's lawyer, Lee Eastman, officially ended de Kooning's arrangement with Janis, an exhibition scheduled for later that year was cancelled. (DK475) Janis claimed that de Kooning owed him money. Spring 1965: Willem de Kooning and Susan Brockman move. April 8 - May 2, 1965: Willem de Kooning retrospective at Smith College. May 23, 1965: David Smith dies in an automobile accident. David Smith died in a car accident near Bennington Vermont. Robert Motherwell was designated as the executor of Smith's estate. In 1969 the Guggenheim Museum held a retrospective of Smith's work. June 16 - August 1, 1965: "New York School: The First Generation: Paintings of the 1940s and 1950s" at the Los Angeles County Museum of Art. Included work by Barnett Newman, Clyfford Still and others. Late Summer 1965: Susan Brockman moves back to New York. Autumn 1965 through 1966: Willem de Kooning sorts out legalities, including a will. According to de Kooning's biographers, "In the Springs, an important early assistant had been the painter Athos Zacharias, who helped de Kooning establish his initial studio in the garage on Accabonac... But Zacharias would not work full-time, so de Kooning hired John McMahon... for the next twelve years McMahon devoted much of his life to de Kooning... After several years as de Kooning's full-time assistant, McMahon... began looking for another artist to help out." (DK481) Michael Wright was offered the job. He later recalled, "This was '65. Bill came over one day while I was doing carpentry on John's house and he said, 'I heard all about you. That you're an artist and have three kids and been in the army. That's impressive. Want to work for me? You work for me three days a week and get four days off to do your own work." (DK481) Wright accepted the job. Mid 1960s: Willem de Kooning has an affair with Molly Barnes. Barnes was from California and spent summers on Long Island, with occasional visits during the rest of the year. Her father and first husband were involved with the movie business. She was approached by John McMahon at the post office where he and de Kooning would collect the mail and told her, "Mr. de Kooning would like to meet you." July 16 - August 1, 1965: "The New York School: The First Generation, Paintings of the 1940s and 1950s" at the Los Angeles County Museum of Art. September - October, 1965: "Lee Krasner; paintings, drawings and collages" exhibition at the Whitechapel Gallery in London. September 1965: Barnett Newman travels to Brazil to see his work at the Eighth São Paulo Bienal. October 1-November 28, 1965: "Robert Motherwell" retrospective at The Museum of Modern Art. After showing at MOMA the exhibition traveled to Amsterdam, London, Brussels, Essen and Turin during 1965 - 1966. October 1965: The director of the Tate in London visits Mark Rothko. October 13, 1965: Robert Scull sells thirteen Abstract Expressionist paintings at auction. 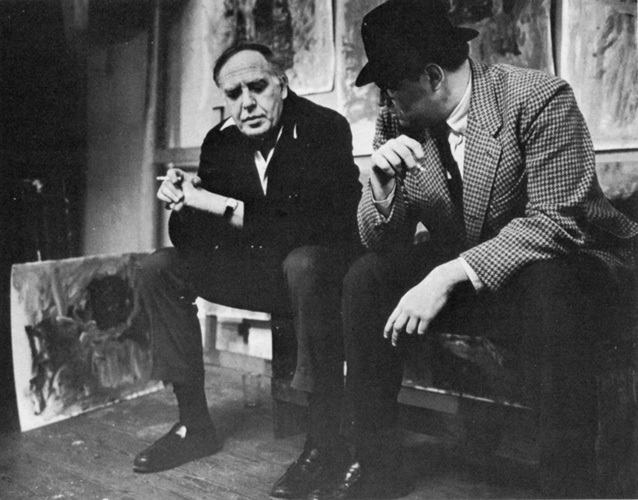 Winter 1965 - Winter 1966: Philip Guston has an affair.